Sonoma Garden Park, located at 19990 East Seventh Street, is a hidden jewel on the east side of Sonoma. It’s 6 1/2 acres are owned by the city of Sonoma and operated by Sonoma Ecology Center. It provides a beautiful, natural environment for educational and recreational activities. Most of the Park is dedicated to food production by staff and by gardeners in their individual garden plots. In 2007 Master Gardeners became an important part of the Garden Park. Every Saturday morning from early spring through the fall, the Garden Park holds a Harvest Market in the barn where they sell the vegetables, fruits, eggs and honey grown there. Master Gardeners staff an information table in front of the barn where they greet and share the latest gardening information with visitors. 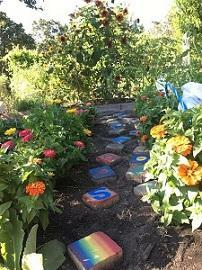 Sonoma Garden Park provides a wonderful classroom where children learn with hands-on gardening. We have access to the diverse 6 1/2 acres and all the things going on there. 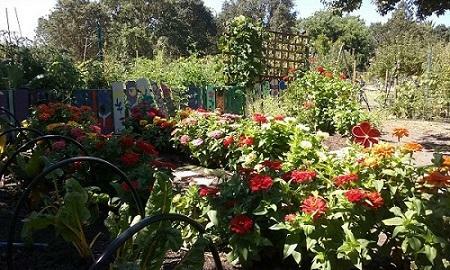 Master Gardeners have a large demonstration garden, the Children’s Garden, where area children plant, tend and harvest. They learn by doing. In the spring and fall fourth grade classes of nine and ten year olds come to the garden for a day. We are with them for the morning, two Master Gardeners each morning. We do whatever the season requires and sample whatever is available in our garden. In the summer the Ecology Center holds Harry Potter Science Camps. We are there three mornings a week during the five Camp sessions. The children are from six to twelve years old. We enjoy mornings picking blackberries, picking delicious ripe fruit and working in the garden. We provide opportunities for a sense of accomplishment and mastery for young gardeners. We provide an ecological awareness and connection to nature. Just being in the garden and the wide-open Garden Park is a joy for the children and for Master Gardeners.